The key to success in any annual flower or veggie garden is a properly prepared soil bed, and in an urban environment, the best way to prepare a soil bed is to use a raised bed. Generally speaking, raised beds are filled with 8 to 10 inches of soil and are no wider than 4 feet so you never have to step in the bed to reach your plants. The soil is ready faster. Soil in raised beds warms up quicker and dries out faster in spring, allowing you to plant sooner. The soil stays loose. Because raised beds are no more than 3 or 4 feet wide, you should be able to reach into the center of your bed from either side. You don’t have to walk or kneel on the soil, reducing soil compaction and making it easier for root crops in particular to grow. You can concentrate your watering, fertilizing, and weeding. Because you’re growing in a compact space, watering, fertilizing, and weeding are much easier to do than if you were working in a big yard plot. A raised bed defines your garden. Urban yards are often home to many competing activities, such as kids playing, dogs running, and visitors walking around. A raised bed clearly shows where your garden begins and ends. A raised bed is easier to work. Because raised beds are elevated, you don’t have to bend down as much. You can make them taller than 10 inches if you really don’t want to stoop, and you can make the edges wide enough to sit on while you work. Raised beds can be permanent or temporary. Permanent raised beds: These beds are constructed of a long-lasting, rot-resistant material, such as cedar or hemlock wood, composite plastic wood, concrete blocks, bricks, or stones. Avoid using any chemically treated woods because their chemicals can leach into the soil. To build a permanent raised bed, build a frame of the wood or material of choice making it no wider than 3 feet so you can reach the center of the bed without stepping on it and 10 inches tall. Keep the bottom open. If you’re placing the raised bed over a grassy area, mow the grass low, then add the compost and topsoil to fill the bed to the top. The compost and topsoil will kill the grass so there’s no need to remove it. 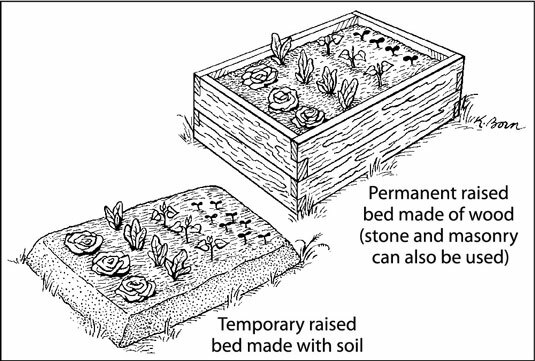 Temporary raised beds: You construct these beds each spring without permanent borders (hence their name!). The beauty of temporary raised beds is that they allow your artistic side to come out. You can make them in almost any shape you want, including circles, squares, rectangles, and hearts. To create a temporary raised bed, simply mound up the soil from pathways onto the bed area or bring in fresh soil until the bed is about 12 inches tall. Turn the soil in the bed and rake the top of the bed flat and smooth. Soil is sometimes at a premium in city yards, so you may need to bring in some soil to fill your entire bed. The best soil to use is a combination of topsoil and compost. A 60/40 mix of topsoil to compost provides the nutrients your plants need without overfeeding. Each spring, you need to top your raised bed with 1 to 2 inches of compost for the season. If you’re building your raised bed on an impervious surface, such as asphalt or cement, you need to build the bed a little taller (2 to 4 inches) and place landscape fabric under it. Although the landscape fabric is a woven material that lets water penetrate, it prevents the soil from eroding away during rainstorms and prevents any harmful chemicals from moving from the asphalt or cement into your soil.